Buying a pair of eyeglasses is a uniquely personal decision. It’s not so much private as it is something that you simply have to decide for yourself. You know not only your style and taste for frames better, but also what w orks with your face and will be comfortable on your head and in front of your eyes every waking minute of the next year or two. No one can or should make your glasses choices for you unless they know you well or are unusually intuitive. After all, it’s both your ability to see and an accessory that will be remembered as one of your most defining features. 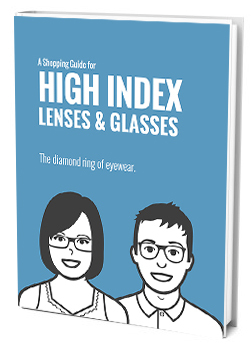 Some people wear their glasses like work equipment, all heavy frames and shatter-resistant high index lenses. Others wear them like jewelry with glimmering wire frames and the thinnest possible lenses for the design. No matter what your personal style is, one struggle that all glasses wearers share is driving and outdoor safety. Between the limited peripheral vision and the tendency for lenses to create glare only exacerbates the problem of switching from your normal glasses to shades whether you’re driving between tall buildings or trying to work in an outdoor jobsite. That’s why transition lenses have been growing in popularity for over a decade and with recent advancements in the formulas and function of transition lenses, bespectacled people around the world can once again significantly improve their glasses-wearing experiences. Among the new innovations in transition lenses, there are Transition Signature for a classic performance, Transition Vantage for reactive polarization, and today’s favorite, Transition Xtractive which provides the darkest tint in the greatest variety of circumstances. If you want to really protect your eyes no matter where you go, from brightly lit offices to glaring sunlight on the commute, high index transition Xtractive lenses are your best current option. a second long or the constant flicker of driving through trees at an inconvenient angle. Among all the transition coating options, Transition Xtractive is by far the most reliable and responsive self-darkening lens for driving in the car. In the past, transition lenses may have had trouble discerning the dim light level inside the car versus the brighter lights passed the windshield. Xtractive lenses are much more reactive and will be able to keep your eyes safe in flickering environments and during big light changes as well like driving under overpasses and through neighborhoods with variable sun blocking capabilities. Xtractive lenses are your number one option for safe driving with or without a prescription because they tint just the right amount for the current light levels. The concept of UV protection is one you’ve probably seen around, especially when looking for sunglasses solutions. The sunlight brings with it a variety of rays including the heat we enjoy so much. However, it also brings UV which has been proven to cause both sunburns and skin cancer. While you can put sunscreen on your skin, what about your eyes? UV doesn’t give you eye-burn but it can do something much worse. People who have spent a lot of time outside without UV protection are far more likely to develop cataracts and to do so more quickly than others. For the past few decades, UV protection has been a buzzword to boost sunglasses sales but you might be surprised to learn that not all shaded lenses block UV and not always 100% of the UV is blocked even with protection. Transition Xtractive coating, on the other hand, can be counted on to provide complete protection from harmful UV rays whether or not they are actively tinted. If you’ve had transition lenses in the past, you may be familiar with some of the weaknesses in the original design. For instance, many transition lenses have trouble darkening in warm temperatures, as the heat slows down and reduces the chemical reaction that occurs when light hits the lens coating. This often meant that your automatic shading feature actually worked less well when you needed it most, in the blazing summer sun. Another noted issue was that sometimes the transition lenses could not become dark enough for wearer preferences. The high index lens community is proud to say that the latest Transition Xtractive coating has solved both of these problems by advancing the formula and responding to the needs of glasses wearers everywhere. Xtractive lenses provide the darkest of all transition lens coating options and have been designed to darken completely even in high-temperature environments, allowing you to truly rely on them as your vision shading solution. Of course, outdoors isn’t the only place you may need protection from harmful or uncomfortably bright lights. Many office buildings mistake over-lighting for motivation or efficiency. Very bright lights are a signature of certain work environments but that doesn’t actually mean that employees enjoy the glare. Transition Xtractive lenses work well indoors for the same reason they work well in the car, because they are hyper-responsive to the visual needs of the wearer. Any time your environment exceeds a comfortable level of brightness, the lenses will begin to gently tint, allowing you to be more comfortable in brightly lit offices and other work environments. While we’ve known about the dangers of UV for some time, it’s only recently that research has revealed that some blue light as emitted by computer screens and certain electric lights can also be harmful to the eyes. To be specific, blue light can result in retinal damage that contributes to slow blinding conditions like macular degeneration. Unfortunately, here in the digital age, the vast majority of office workers are constantly exposed to blue light from screens with minimal protection. One of the less mentioned benefits of transition Xtractive coating on your next pair of high index glasses is that they not only block all UV all the time, they also have twice the amount of blue light protection compared to normal clear lenses and more than six times protection when outside and the lenses are fully tinted. 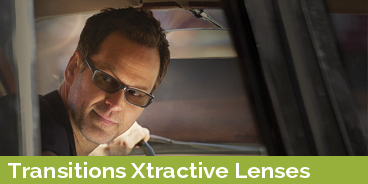 Finally, one of the best benefits transition Xtractive lenses can offer is their ability to protect sensitive eyes. No other transition coating is as reactive or completely protective as the Xtractive line and you can have the coating added to any high index plastic lens from 1.60 all the way up to 1.74 depending on your preference, style, and budget. The choice is entirely up to you and what you think would be enjoyable. Why not go all-out on your next pair of glasses and really take care of your eyes? With Transition Xtractive lenses, you can have clear glasses for the office, shades for outdoor adventures, and gradient shading for every situation in between.